Has the special investigation team probing the murder of journalist-activist Gauri Lankesh finally cracked the case? Nine months after Lankesh, 55, was shot dead by unidentified assailant(s) outside her home in Bengaluru's Rajarajeshwari Nagar, the SIT says it has closed in on the prime accused. The team filed it first charge-sheet in the 3rd additional chief metropolitan magistrate court on May 30. Soon after, on June 10, it arrested 26-year-old Parashuram Waghmore, a hindutva activist from Sindhagi in Vijayapura district. Waghmore, who has been remanded to police custody till June 24, perhaps holds the key to solving the mystery. The SIT, however, has not confirmed whether Waghmore or his absconding accomplice is indeed the shooter. The team is yet to recover the weapon and the two-wheeler used in the crime. Waghmore, a BCom graduate, moved from Sindhanur in Raichur district to Sindhagi, with his father, Ashok, who sells utensils, mother Janaki Bai, and a younger brother. Reportedly, Waghmore was associated with pro-hindutva organisations like the Sri Ram Sene. He was earlier arrested for hoisting the Pakistan flag outside the taluk office, reportedly to disturb communal harmony, in 2012. “My son was active in the organisation, but he is not a killer. He is innocent,” said Janaki Bai, who threatened to commit suicide if he is harmed. A major breakthrough in the case came when the SIT arrested 38-year-old K.T. Naveen Kumar, alias Hotte Manja, a hindutva activist from Maddur in Mandya district, on February 18. The Central Crime Branch of Bengaluru City Police had arrested Naveen under the Arms Act, 1959, based on information that he had arrived in Bengaluru to sell firearms, illegally. And, the SIT investigating the Lankesh case started interrogating him. Naveen, along with 37-year-old Sujith Kumar, alias Praveen, is suspected to have supplied firearms to the assailant(s). A 7.65mm country-made pistol was used, and four bullets were fired at Lankesh. The SIT says accused Parashuram Waghmore could hold the key to solving the case. The SIT quoted Naveen as saying that Lankesh was killed for her “anti-Hindu” views and “criticism of Hindu gods”. Interestingly, the charge-sheet also mentioned that there was a “bigger network” and that Naveen was part of a larger conspiracy. However, it does not name the killer. The 650-page charge-sheet has 131 statements, including those of forensic experts, eyewitnesses, Lankesh's family, doctors who performed the autopsy and the officers who visited the crime scene on September 5. However, the statements of Naveen and his friends from Maddur, made before a magistrate, have not been made public. The SIT has held back from publicising 140 pages of the charge-sheet, saying it would hamper further investigation. In the charge-sheet, the SIT said that Naveen was tasked with logistics and gathering information about Lankesh’s movements. He has been charged under IPC sections 118 (concealing intent to commit an offence), 120B (criminal conspiracy) and 35 (criminal intention). 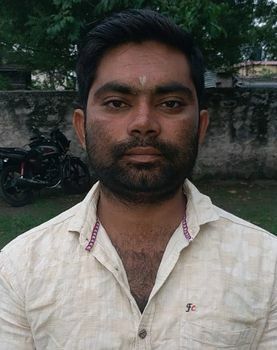 On May 20, based on information given by Naveen, the SIT arrested Praveen, a native of Shikaripura. 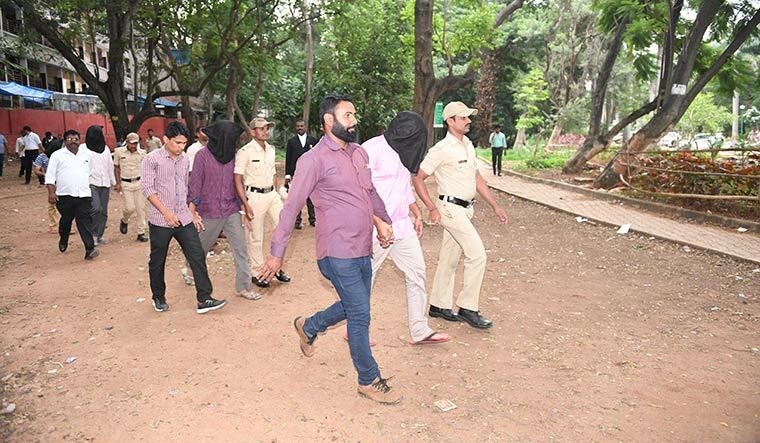 During interrogation, he named Amol Kale, alias Bhaisab, 40, and Amit Degwekar, alias Pradeep Mahajan—both from Maharashtra—and Manohar Yavade, 30, from Vijayapura. All three were arrested from Davangere and, reportedly, confessed to hatching a plan to kill Mysuru-based rationalist K.S. Bhagwan on September 9, 2015. On June 11, the court extended Naveen's custody to June 25, and the others' to June 14. All the accused are currently in the Bengaluru central jail. According to SIT sources, Naveen and his brother Thimme Gowda started a Mandya-based outfit called Hindu Yuva Sene in 2015. Naveen used to boast of possessing arms and is believed to have given shelter to right-wing extremists. Naveen's friend Amit, who deposed before the court, apparently said that Naveen was plotting to kill Bhagwan and had even formed a group to carry out the task. The charge-sheet also accuses Naveen of supplying the bullets that were used to kill Lankesh. According to the SIT, Naveen met Praveen at religious gatherings, and eventually became part of the team. Praveen had been working with the others and took instructions from Kale and Dada, alias Nihal, who is absconding. “They started recruiting youth from various villages in Mandya for the Bhagwan operation,” said SIT sources. Syed Shabbir, 30, who works in an arms and ammunition store in Kalasipalya, has said he sold 18 bullets to Naveen eight years back. Shabbir did not sell him a gun, as Naveen did not have a licence, but sold him two air guns for Rs 3,500 each. Naveen convinced Shabbir that he would use the bullets to make lockets. Shabbir sourced 18 0.32 calibre bullets from his friend Amjad, who worked in another armoury, which he then sold to Naveen for Rs 3,000. While the charge-sheet does not mention any organisation, Naveen's wife Roopa C.N., in her statement to the police, said that her husband was associated with Sanatan Dharma Sanstha. Roopa said her husband was a Janata Dal (Secular) worker and had developed links with the Sanstha in 2017. When she attended a programme in Shivamogga, she was introduced to people from the organisation. She said that, a few months before last Dasara, Naveen had brought home bullets and a pistol. He claimed they were dummy bullets to scare away monkeys on the farm. Roopa said that Naveen invited a person from Sanatan Sanstha to their house after Dasara. The person spent the night there. Interestingly, she also said that on the day of Lankesh's death, she and Naveen had gone to a Sanstha ashram in Mangaluru. She came to know of Lankesh's murder while watching television and had told Naveen about it. Some discrepancies in the charge-sheet have raised questions over the procedures followed in the investigation. For instance, while the police claim Naveen was picked up from the Majestic bus station in Bengaluru while trying to sell live bullets on February 18, Naveen’s family said he was picked up by police from Birur in Chikkamagaluru on February 14. While the SIT said that Naveen had taken the prime accused to a place close to Lankesh's house on the day of the crime, Roopa's statement mentions that she and Naveen were travelling to Mangaluru on that day. Naveen has also not been consistent in his statements. Last April, the SIT took the court's permission to conduct a narco-analysis on him at Gandhinagar. However, once the team reached Gandhinagar, he refused to undergo the test. Naveen claimed that the police coerced him into giving consent, and had assured him that they would help him secure bail. Meanwhile, the counsel for the accused said that the investigating officers did not follow the procedures and specific guidelines issued by the Supreme Court while making arrests.